Last week CO and I put together a Friendsgiving for our crew. Friendsgiving is an annual event among a group of my friends and we thought it could be really fun for the little’s to do this year as well! C and I love nothing more than planning a themed mini party for our crew. It gives us both an excuse to put the right side of our brains to good use, which lets be honest, after some days of chauffeuring our kids, attending meetings for volunteer activities, and working, our right brains are screaming for an outlet. Once we confirmed the idea and the date we got to work! This Friendsgiving party was “easy as pie” (a new saying from my 5 year old) to throw together and we had a lot of fun planning it and getting in the holiday spirit. It was also a great way to kick off the season and give the little’s an opportunity to celebrate Thanksgiving together. First we prepared for the party by getting the crew together to create our Friendsgiving Thankful Hands Tablecloth. (We used the same basic idea as our DIY Dropcloth Tablecloth for valentines day.) This time I bought a 6×9 dropcloth and we cut it in half. The half was the perfect size for a kids table. I also picked up a few colors of paint from the Kids Made Modern line at target. We painted each of their hands with the rose gold color to make the handprint on the tablecloth. After that we let them go to town decorating with the other three colors, sponges and paint brushes. When they were done and the paint dried we wrote their name, what they said they were thankful for, and their age. It turned out to be a really fun activity and it is seriously adorable. For the party, we set it up in the backyard with my outdoor kids table. CO’s kids chalkboard made the perfect backdrop. To make it festive we used a Friendsgiving banner from the target dollar spot, fall themed paper plates, our Thankful Hands Tablecloth, and a Thankful tree (which I found at Target). What would we do without Target?! You prepare the cake mix as instructed on the box. Then you spoon the batter into the sugar cones and bake them. This is where I ran into some trouble. My daughters teacher used a cooling rack to keep the cones upright in the oven. I believe I put too much cake batter in the cones and they started to fall over. We are going to test this one again to see if we can figure out where I went wrong! Regardless, cake baked into the cone and they were still useable for our party. Once they bake you dip the bottoms into the chocolate and then let the kids go to town with the sprinkles. First they paint the paper plate with the water colors to give the Turkey’s feathers some color. Once that is complete you assemble to construction paper on the plate to look like a turkey. The girls really enjoyed this craft. All said Friendsgiving turned out to be a fun after school activity to help everyone get in the spirit of the holidays. It was simple enough to throw together and the kids loved it because it was a “party”! This is definitely something that can be thrown together for your little and their closest friends this week or weekend leading up to thanksgiving. Remember to discuss what everyone is thankful for during your party! Game of Thrones fans just totally swapped Winter for Fall while reading that sentence so I’ll say it one more time. This means kids going back to school, football season, pumpkin flavored everything, leaves changing, and a landslide of birthday parties to plan and attend. I’ve been wanting to write a post on gift wrapping for a while because I legitimately enjoy the wrapping part just as much or more than the gift choosing. First I choose the paper and let the children decorate it if it’s for a child’s birthday party. We usually do crayon scribbles, watercolor, or washable paint. If it’s for an adult outside of our family I will usually leave it plain. Next you can wrap the gift and finish with twine (and simply tie a bow or add a fun bow) or yarn with some Pom Poms as shown below. Ever since my oldest wore a flower crown in my brother in law’s wedding I have been convinced that I can make one. Then Co’s oldest wore one recently in a wedding and I was sold. I had to try it. How hard could it be?! I’m here to tell you, it’s not that hard! It just takes a little patience and “creativity” to get through the first one! I picked up some flowers and greenery at my local Whole Foods (they have the best flowers in my opinion). I stuck with baby’s breath and daisies for the flowers. The peonies pictured below were for a gift bouquet but I left them in the picture because they were so pretty! Then I picked up floral wire and floral tape at Hobby Lobby, but I am sure you can find these at any craft store. If you don’t have some already, pick up a pair of wire cutters while you are there too. They will make this project so much easier. Hobby Lobby also had grapevine wire, which I think could look really pretty if you wanted to try to use that in place of the green floral wire for the crown (you will still need the green wire to secure the flowers to the crown). My husband’s birthday falls on Father’s Day most years which makes for a lot of celebrating, but this year being his 30th I decided to throw him for a loop and make it extra memorable with a surprise party! As the school year comes to an end and the summer draws near, I have started reflecting back on how much both of my littles have grown. As I was thinking about my special memories from the school year, I realized I wish I was being more proactive about holding on to them. Cue Pinterest. 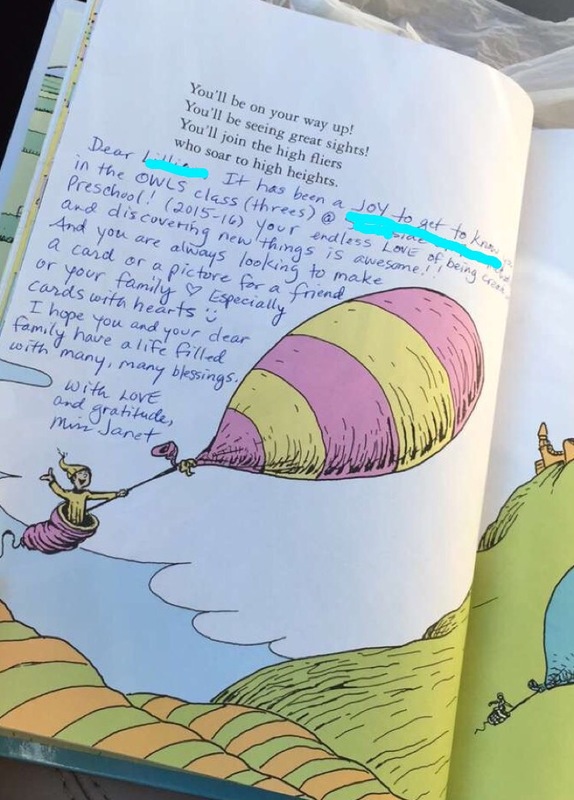 Everyone has seen it floating around on Pinterest, the “Oh The Places You’ll Go!” book filled with teachers notes from a lifetime of school experiences. I had always kept this idea in my back pocket and planned on doing it, but as the end of school got closer and closer I realized I had done nothing about it. Cue Amazon Prime. 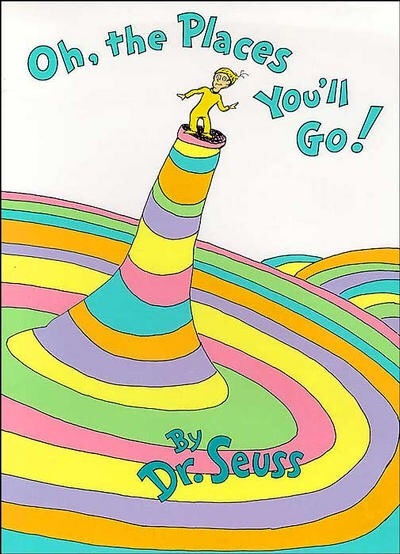 I ordered “Oh The Places You’ll Go!” by Dr. Seuss on Amazon (for half the price as target). It was delivered two days later. I then dropped it with my oldest littles teacher and got it back a week later with two heartfelt notes. I cannot tell you how thrilled I am that I did this. The teachers were wonderful and wrote sweet messages to my daughter highlighting what they love about her and what her favorite things to do in class are. Their messages were just as heartwarming for me to read as I am sure they will be for her to read when she graduates highschool. Her teachers play such a large part in her day to day and are helping set the foundation for future educational and life experiences. Of course I want to preserve how they experienced her! The best part of this book is that the mark they are leaving on her is tangible. We will have this book forever. As memories start to fade, my oldest will be able to read these messages and remember little experiences from her past. Thank you to the genius parent that did this and shared the idea! With that said, there is still plenty of time to do this before the end of the school year!! It doesn’t matter what grade your child is in, start one today! If you have prime I highly suggested ordering from Amazon (Amazon – Oh The Places You’ll Go). It will save you about $7-$10 and it with the press of a button it will show up at your door. You will not be disappointed you did this and the teachers are so happy to do it too! In the spirit of Spring and Easter being upon us we have a fun time killer activity for you and your littles! We planned an Egg Carton Scavenger hunt for the littles of the neighborhood and it was a hit! Not only does it make good use of all those egg cartons you will have laying around after Easter egg decorating, but it is entertaining for a wide range of ages. To create this activity, CO cut egg cartons in half so each little would have a carton with six spots. She then painted a different color at the bottom of each spot. The premise behind this activity is to find an item that is in the color group of each spot and place it in there. In our house we always look forward to Spring and all the activities leading up to it! One of our very favorite Spring time activities is planting new flowers in our flower beds and pots. My little loves to pick out the flowers and help plan where they should be planted. We had been having an especially warm February which meant we were in the spring spirit even earlier than the norm. My mom’s birthday is in February and thanks to Court’s fabulous pot painting party for her 5 year old and my mom’s love for gardening, my little and I decided what could be better than painting a large flower pot for Grandma’s birthday? So off we went to the craft store. I love to keep snacks on hand that are healthy and easy to make but my kids think are a special treat. This is an especially awesome snack because it is only three ingredients, the kids can help make it, and my kids think I’m the best mom ever because I let them get it themselves from the freezer. To make this very, very special treat that is like ice cream but really just greek yogurt and fresh berries, you only need three ingredients and one kitchen tool. Here is another cute Valentine idea with a wrapping that can wear many hats. This year I decided to stroll down the party favor aisle and let my daughter choose an item to give her friends. She was insistent on sticky homework snatchers so I made a mental note of the phrase that popped in my head: “I hope you STICK around cuz I really like you”and threw them in the cart. After grabbing some gold metallic washi tape & striped pillow boxes we were all set. Lucky for me, I already had the rest of the supplies at home. 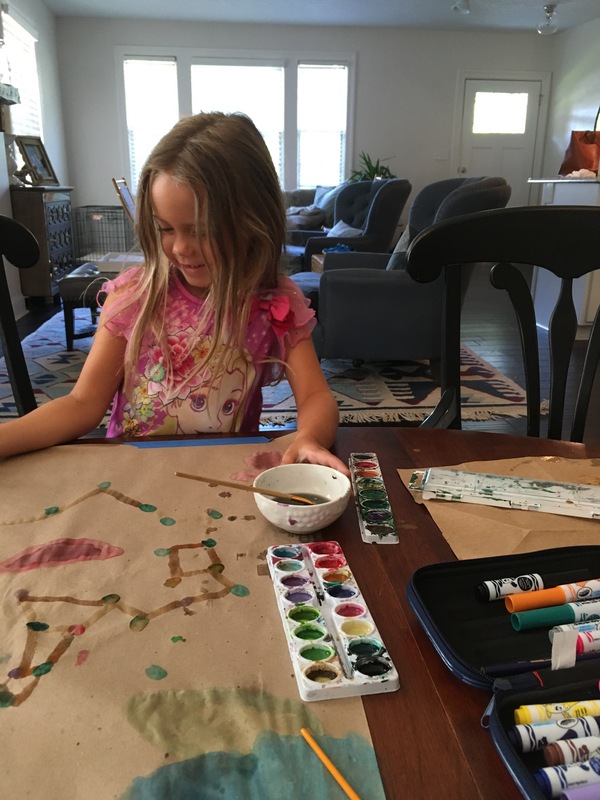 I try to turn any mom responsibility into an artsy project. Although it’s obviously more work, (cue my husband grumbling as he looks at me elbow deep in paper, scissors and metallic tape) it’s a way to feed that creative monster living inside some of us (namely me). For my son’s class Valentines this year, I decided to use the phrase “You Rock!”. He is all boy and loves the song “bad to the bone” so it was a perfect fit!